Should the Fed Worry About Unemployment? One of the things most people don't realize when they watch the Federal Reserve move the levers of U.S. monetary policy is that its leaders actually wear two hats. The Fed's marching orders from Congress are to "promote effectively the goals of maximum employment and stable prices." 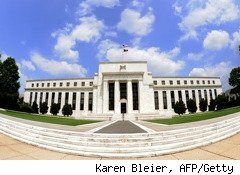 One of the hottest debates among economists right now is whether the Fed should try to do both jobs – what's known as the Fed's dual mandate -- or just focus on prices, i.e., inflation. Criticism of the dual mandate is often loudest from the political right, as exemplified by Mark A. Calabria, director of financial regulation at the Cato Institute. Calabria and his colleagues at the libertarian think tank maintain that there is no connection between keeping inflation low and reducing unemployment. "The consensus among economists is that the Fed can't do anything about employment in the long run, and the debate is even whether they can do something in the short run," Calabria says. He points to the fact that the Federal funds rate, the key benchmark interest rate in the country, has been at close to zero for two years, yet the unemployment rate has not come down significantly. Karen Dynan, vice president and co-director of the economic studies program at the nonpartisan Brookings Institution in Washington, D.C., disagrees wholeheartedly with that assessment. "There is a strong case that the Fed's efforts thus far have made the recovery stronger than it would otherwise be," Dynan says. "There is increasing evidence out there that the Fed did help to ease financial conditions, and a large body of evidence suggesting that easing financial conditions helps boost spending and demand." Dynan says that given the current economic circumstances, the Fed at the moment "can certainly do both jobs." But Calabria says the Fed has basically stopped worrying about price stability for political reasons, and has become "obsessed" with the unemployment rate to the exclusion of other, more important, economic worries. "I don't think they care about price stability at all," he says. Of course, the Fed might not be focusing on prices now because they aren't a pressing issue: The U.S. inflation rate reported this week, 1.2%, is the lowest since records began being kept. Calabria, though, says the core consumer price index used by the Fed to measure prices doesn't capture all the inflation in the economy, and that inflation expectations have been edging up while the Fed is focused on bringing down unemployment through its program of buying government bonds, a process of loosing the money supply known as quantitative easing. Dynan says that it would be a mistake to believe the Fed has magical powers to turn the economy around, but that its policies can help lessen the pain of unemployment when you have millions out of work. "I don't think the two goals are inconsistent much of the time," she says. The real issue will come when the results of quantitative easing program start to overheat the economy. Will the Fed raise interest rates even if there is still high unemployment? Dynan believes they will. Calabria, by contrast, says it's a mistake to give central bank officials so much discretion to choose which policy they favor. Instead, he would like to see clear rules drawn up about when the Fed should focus on containing prices. He notes that other central banks, including the European Central Bank, have only one policy objective: price stability. "I think the ECB has a better track record than the Fed on price stability," he says. However, inflation in the U.S. at the moment is running well below the 1.9% rate being experienced by the EU. Dynan says that's why the Fed should be more worried about deflation, the spiraling down of prices that reduces consumer demand and wages, and leads rapidly to recession. Deflationary spirals are exceptionally difficult to end with government policy measures.